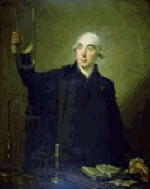 Joseph Black, the son of a wine merchant, was born in Bordeaux, France, and studied languages and natural philosophy, and later, medicine and chemistry at Glasgow University (1746-50). He moved to Edinburgh in 1751, where he presented his thesis in 1754. Black published very little and the thesis, expanded and published as Experiments upon Magnesia Alba, Quicklime, and some other Alcaline Substances (1756), contained his most influential work. The paper in fact marked the beginning of modern chemistry. Black investigated quantitatively the cycle of reactions: limestone >>quicklime >>slaked lime >>limestone, and showed that the gas evolved ('fixed air' or carbon dioxide) is distinct from and a constituent of atmospheric air, and is the cause of the effervescence of limestone with acids. He proved that mild alkalis will become more alkaline when they lose carbon dioxide and they are converted back to mild alkalis through reabsorption of the gas. Black's other great discovery was that of latent heat (the heat required to produce a change of state). The concept of latent heat came to him in 1757 and the experimental determination of the latent heat of fusion of ice was made in 1761. The next year he determined the latent heat of formation of steam. Black also distinguished the difference between heat and temperature and conceived the idea of specific heat. Black was professor of medicine and lecturer in chemistry at Glasgow (1756-66) and then professor of chemistry at Edinburgh for the rest of his life. Black's lectures, which he gave for over 30 years, were immensely popular and were published in 1803.